A study was conducted to compare the sealing ability of mineral trioxide aggregate, calcium phosphate cement, and bone cement in furcation perforation repair. The study samples comprised 70 human extracted permanent mandibular molars. The teeth were noncarious with nonfused and well-developed roots. The teeth were cleaned by placing in a 3% solution of sodium hypochlorite and then were washed with water. The 70 teeth were randomly divided into 5 groups. Group V: Negative control - n=5, furcation area intact, no perforation done. The access cavity preparation was done on all the three experimental groups and both the control groups. The pulp chamber was debrided of pulp tissue remnants and debris. Canals were then cleaned and shaped using hand and Rotary ProTaper NiTi files (Dentsply, Switzerland). Then the teeth were obturated using 6% Gutta percha points. External surfaces of roots were covered with two coats of nail varnish. Perforations were created at pulpal floor of each tooth centered in both the buccolingual and mesiodistal planes using round diamond point (BR-41, Mani, Japan). Teeth were then inserted approximately to the level of the cemento-enamel junction into flower arrangement sponge with normal saline solution. Each repair material was mixed according to the manufacturers' instructions and was packed into the perforation defect to the level of the pulpal chamber floor. The materials were then allowed to set and access cavities were sealed with IRM (Dentsply) and covered with two layers of varnish. Teeth were left in moist sponge for 24 hours till the complete set of the repair material. The teeth were then removed from moistened sponge and cleaned with cotton pellets and were then immersed in a silver nitrate solution (50%, by weight) for 2 hours and then rinsed with a photographic developer solution (Premier, NM Pvt. Ltd., India) for 6 hours. They were then sectioned bucco-lingually in a longitudinal direction with a Diamond Saw (Leco Corp., USA) and finishing of the samples was done with Carborundum Powder (Mesh 300). These sections were examined under Stereomicroscope (Leica) connected to a computer and photographed at a magnification of 20, in order to see the silver nitrate dye penetration in the area between dentinal walls and restorative material [Figure 1]. In each section the actual value of dye leakage was calculated from outer margins of perforation cavity to level of pulpal floor [Figure 2]. The maximum dye penetration along the buccal and lingual walls of either the mesial or distal section was recorded using the Image Analysis Software System (SIS, Germany). These various values were then subjected to statistical analysis. The results of the study were as follows: [Table 1] shows the percentage of dye penetration in groups I-III. 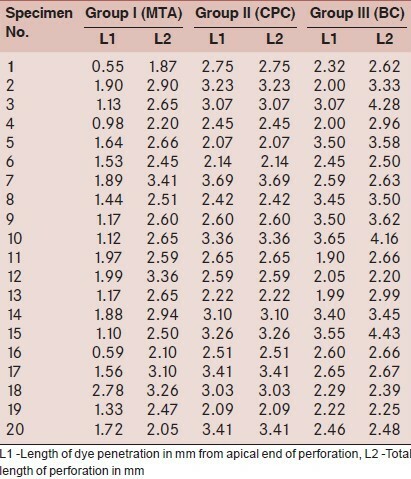 [Table 2] shows the length of dye penetration from the apical end of the perforation (L1) and the total length of the perforation (L2) in various specimens belonging to groups I-III. An unpaired 't' test revealed that different groups exhibited significantly different dye penetrations (P<0.01). Furcation perforation repaired with MTA group I showed minimum microleakage (mean 54.5%), group II calcium phosphate cement showed maximum microleakage (100%) and group III bone cement showed moderate dye leakage (87.8%). Group IV samples which comprised five teeth which acted as positive control showed complete dye penetration. Group V samples which comprised five teeth which acted as negative control showed no dye penetration. Endodontic cases are increasing in complexity to a considerable degree. Cases are managed now that, only a decade ago, would have been thought to be hope1ess. This has encouraged dentists to undertake therapy in more and more complicated cases. But, unfortunately, some of the teeth become involved in procedural misadventures - one of the most aggravating of which is the operational perforation. The present study was conducted to compare the sealing ability of mineral trioxide aggregate, self-setting injectable calcium phosphate cement, and bone cement when used to repair perforations in the furcation area. MTA shows very good biocompatibility and low mutagenic effect. A surprising finding in histological sections is the deposition of cementum on its surface. The sealing ability of MTA has been examined in dye leakage studies,  bacterial penetration,  and with use of fluid filtration system. An in vitro study was done by Payman A‚ Mehrvarzfara et al., to assess the sealing ability of MTA, Geristore® , and amalgam with and without Bioglass as a matrix used to repair furcation perforations in mandibular molars by using dye penetration. They concluded that MTA and Geristore® have shown acceptable sealing ability in furcal perforation in comparison to amalgam, while Bioglass as a matrix beneath them had reduced their sealing ability. A series of cases wherein furcal perforation was repaired using MTA was reported by Pace et al. They concluded that MTA without matrix provides an effective seal of root perforations and clinical healing of the surrounding periodontal tissue. A long-term study also showed normal tissue architecture adjacent to the repair site with MTA. From all these studies, it seems that MTA provides a better seal than other commonly used restorative material, such as amalgam, IRM, and super-EBA. These findings are in agreement with our findings. One reason for the very good sealing ability of MTA, when used in furcation perforation repair, is the excellent adaptation of the material to external margins of the perforation cavities. A cement formulation devoid of these problems has been developed in India by Sree Chitra Thirunal Institute for Medical Sciences and Technology, Trivandrum, Kerala, India. The new indigenous formulation (injectable calcium phosphate cement) has viscous and cohesive properties, which is achieved by incorporating a gelling agent. The ratio of gelling agent is optimized to 2% w/w. The setting time was found to be approximately 20 minutes. The compressive strength was observed to be 11.12 Mpa, which is in the range of trabecular bone. The cement also passed the biocompatibility-screening test (hemolysis and cell culture cytotoxicity test). In our study, injectable calcium phosphate cement which was used to repair furcation perforation was inefficient since the material was partially washed away and the silver stain had entered massively into whole perforation cavity. This is in accordance with the study by Tsatsas et al. where similar results were obtained with tricalcium phosphate. Another material that may potentially provide the necessary properties for furcation perforation repair is bone cement. Bone cement (CMW, DePuy, Johnson and Johnson, England) is common in the practice of orthopedic surgery, especially in artificial hip replacement. The material is packaged as a powder (polymethylmetacrylate polymer, methyl methacrylate-styrene-copolymer and barium sulfate) and a liquid (methyl methyl methacrylate monomer) that are mixed at the time of application. The bone cement is said to exhibit low cytotoxicity and the bone cement powder was found to be nontoxic in nature. It exhibits excellent biocompatibility thus may allow for tissue reattachment. In addition, bone cement tolerates a moist environment very well. Blood contamination of bone cement resulted in a slight decrease in shear strength and no difference in mechanical penetration of the cement into the bone-bone cement interface. These characteristics potentially make it a suitable and desirable perforation repair material. The present study gives comparable results as study by Holt and Matthew  with dye leakage of Bone cement (87%) intermediate to MTA and calcium phosphate cement for repair of perforation in the furcation area. According to Tsatsas et al. the silver staining technique was used to study the sealing ability of restorative materials. This method was selected for the following reasons. Firstly, silver stain is not affected by the high pH of MTA and secondly silver nitrate is not hydrophilic in nature as are the regular dye markers (basic fuchsine). In addition, the method uses a developer to mark the silver grains, which has a high molecular weight and similar size to that of bacteria. There may thus be a correlation between the calculated silver penetration and the penetration ability of the bacteria per se. All teeth were painted with coat of nail polish to prevent dye penetration into lateral and accessory canals especially in furcation area. Gutman, in his study on furcation region of permanent molars, had reported patency and ability of fluid to pass through accessory canals in furcation. All the materials used in this in vitro study were tested under similar conditions and therefore the material showing the least leakage may be the material of choice for clinical applications. Thus MTA proves itself as a perforation repair material due to its better sealing ability and at the same time ability to stimulate tissue repair. Though there are various studies on MTA as furcation perforation repair, our study is unique in assessing these three cements as furcation perforation repair materials. Additional in vivo and in vitro tests and clinical trials are desirable in order to elucidate the effectiveness of the perforation repair materials. Perforation defects have been repaired with different materials with varying degrees of success. In the present in vitro study, dye leakage was used as a criterion to evaluate the sealing ability of three different materials for repair of furcation perforation. The mineral trioxide aggregate showed the least microleakage. Calcium phosphate cement showed the maximum microleakage. 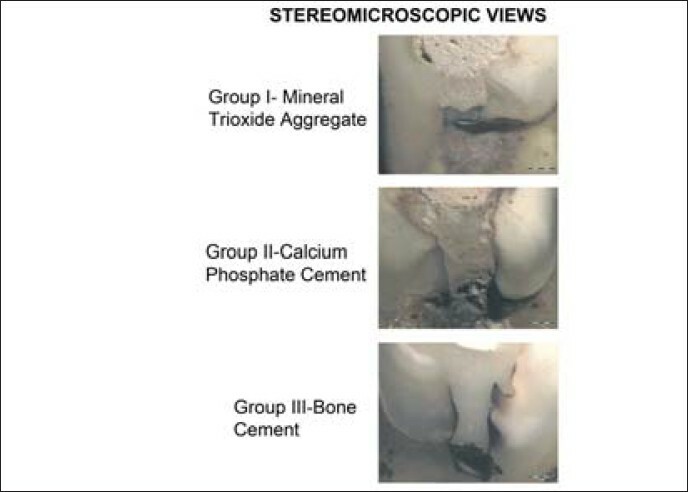 Bone cement showed moderate microleakage. MTA with its added properties like biocompatibility and ability to allow regeneration of hard tissues may improve the prognosis of furcation perforation defect. The self-setting injectable calcium phosphate cement with its properties of biocompatibility and osteoconduction may be used as a barrier material and not a repair material for furcation perforations. Bone cement may show a promise as a furcation perforation repair material due to its biocompatibility and ability to tolerate moist environment. 1. ElDeeb ME, ElDeeb M, Tabibi A, Jensen JR. An evaluation of the use of amalgam, Cavit, and calcium hydroxide in the repair of furcation perforations. J Endod 1982;8:459-66. 2. Aguiree R, ElDeeb ME, ElDeeb M. Evaluation of repair of mechanical furcation perforations using Amalgam, Gutta-percha, or Indium foil. J Endod 1986;12:249-56. 3. Fuss Z, Trope M. Root perforations: Classification and treatment choises based on prognostic factors. Endod Dent Traumatol 1996;12:255-64. 4. Bogaerts P. Treatment of root perforations with calcium hydroxide and Super EBA cement: a clinical report. Int Endod J 1997;30:210-9. 5. Beavers RA, Bergenholtz G, Cox CF. Periodontal wound healing following intentional root perforations in permanent teeth of Macaca mulatto. Int Endod J 1986;19:36-44. 6. Komath M, Varma HK. Fully injectable calcium phosphate cement- a promise to dentistry. Indian J Dent Res 2004;15:89-95. 7. Tsatsas DV, Meliou HA, Kerezoudis NP. Sealing effectiveness of materials used in furcation perforation in vitro. Int Endod J 2005;55:133-41. 8. Harris WE. A simplified method of treatment for endodontic perforations. J Endod 1976;2:126-34. 9. Jew RC, Weine FS, Keene J, Smulson M. A histologic evaluation of periodontal tissues adjacent to root perforations filled with Cavit. Oral Surg Oral Med Oral Pathol Oral Radiol 1982;54:124-35. 10. Smith DC. Acrylic Bone Cement in the new millennium. Orthop Clin North Am 2005;36:1-8. 11. Arens DE, Torabinejad M. Repair of furcal perforations with mineral trioxide aggregate. Oral Surgery Oral Med Oral Pathol Oral Radiol Edod 1996;82:84-8. 12. Firas DM, Saunders WP. In vitro evaluation of furcal perforation repair using MTA or resin modified glass ionomer cement with and without the use of the operating microscope. J Endod 2002;28:512-5. 13. De-Deus G, Petruccelli V, Gurgel-Filho E, Coutinho-Filho T. MTA versus Portland cement as repair material for furcal perforations: A laboratory study using a polymicrobial leakage model. Int Endod J 2006,39:293-98. 14. Weldon JK Jr, Pashley DH, Loushine RJ, Weller RN, Kimbrough WF. Sealing ability of MTA and Super-EBA when used as furcation repair materials: A longitudinal study. J Endod 2002;28:467-70. 15. Mehrvarzfar P, Dahi-Taleghani A, Saghiri MA, Shababi B, Karamifar K, Behnia A. The comparison of MTA, Geristore and Amalgam with or without Bioglass as a matrix in sealing the furcal perforations (In-Vitro). The Saudi Dental Journal 2010; 22, 119-124. 16. Pace R, Giuliani V, Pagavino G. Mineral Trioxide Aggregate as Repair Material for Furcal Perforation: Case Series. J Endod 2008;34:1130-3. 17. Main C, Mirzayan N, Shabahang S, Torabinejad M. Repair of root perforations using Mineral trioxide aggregate: A long-term study. J Endod 2004;30:80-3. 18. Gale MS, Darvell BW. Controlling dentine penetration in computer microleakage tracer mapping. J Dent 1997;25:129-36. 19. Bryan EB, Woollard G, Mitchell WC. Nonsurgical repair of furcal perforations: A literature review. Gen Dent 1999;47:274-8. 20. Freeman MA, Bradley GW, Revell PA. Observations upon the interface between bone and polymethylmethacrylate cement. J Bone Joint Surg Br 1982;64:489-93. 21. Goldring SR, Schiller AL, Roelke M, Rourke CM, O'Neil DA, Harris WH. The Synovial-like membrane at the Bone-cement interface in loose total hip replacements and its proposed role in bone lysis. J Bone Joint Surg 1983;65:575-84. 22. Badr AE. Mineral Trioxide Aggregate as Repair Material for FurcalMarginal Adaptation and Cytotoxicity of Bone Cement Compared with Amalgam and Mineral Trioxide Aggregate as Root-end Filling Materials. J Endod 2010;36:1056-60. 23. Krell KF, Wefel J. A calcium phosphate cement root canal sealer-scanning electron microscopic analysis. J Endod 1984;10:571-6. 24. Chohayeb AA, Chow LC, Tsaknis PJ. Evaluation of calcium phosphate as root canal sealer-filler material. J Endod 1987;13:384-7.